According to estimates from the U.S. Census Bureau, the millennial generation (Americans born between 1982 and 2000) has surpassed the baby boomer generation (born between 1946 and 1964) in size. According to 2015 estimates, millennials numbered 83.1 million compared to 75.4 million baby boomers. While the date parameters are clear for the baby boomer generation, the range is subject to debate for millennials, so for the purposes of this analysis, we are using U.S. Census Bureau definitions. The charts below show the growing dominance of millennials. In 2010, the population aged 45-49, the youngest baby boomers, represented the largest demographic group. 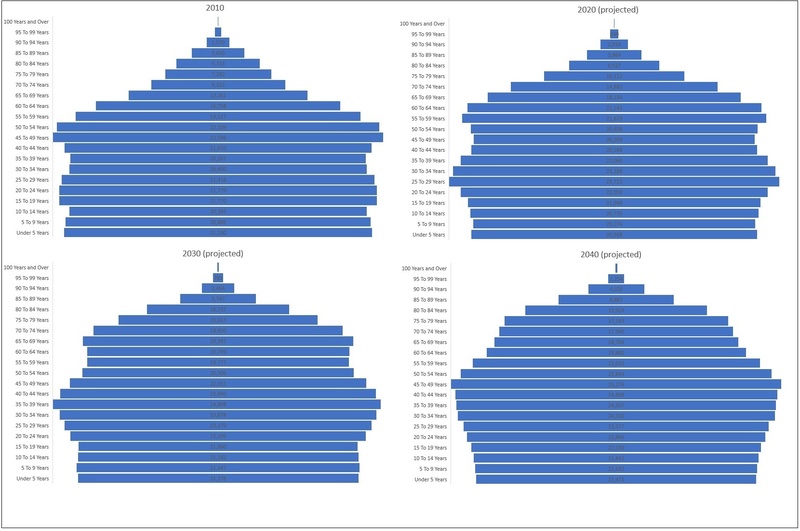 By 2020, Census Bureau projections show that 25-29-year-olds will dominate and we can watch this group aging yet retaining their dominance in the projections for 2030 and 2040. What does this shift from the baby boomers to the millennials mean for the U.S. economy? Due to their sheer numbers, baby boomers dominated American culture for decades. Everything from the economy to popular music has been shaped by this group from the moment they were born. As they age, baby boomers will continue to shape the U.S. economy, and with longer life expectancies, baby boomers are not just living longer, they are remaining active and working longer. The labor force participation rate for Americans aged 55 to 64 (the percent of that population group that is either working or actively seeking work) has averaged above 64% for the last decade, hovering at or near the series’ high. Thirty years ago, the participation ratio was just 54.4%. For the older baby boomers, the shift has been even more dramatic; in 2017, the participation rate for the 65-69 age group was 32.3% compared to 19.5% in 1987, and 19.6% of 70-74-year-olds were in the labor force compared to 10.2% in 1987. While the participation rates for the baby boomers are higher than ever for their specific age groups, baby boomers are still retiring in droves and the sheer number of retirees is putting downward pressure on the overall labor participation rate. We have seen the total participation rate fall from 65.5% to 62.9% over the last 30 years; participation for workers in the prime working ages of 25-54 has fallen from 82.5% to 80.9% over the same period. On average, 10,000 baby boomers hit retirement age (65) every day, and this trend is expected to continue through the year 2030. As more and more baby boomers retire, this will continue to drive down the overall participation rate. Still, the fact is that baby boomers are aging, and their needs are changing. Because the over-65 population will be growing faster than the working-age population, the payout of social security benefits will exceed available payroll tax revenue from current workers as well as drain the social security trust fund reserves. In addition, the rapidly growing numbers of aged Americans also creates a rapidly growing need for health care services. Demand will continue to surge for health care workers, in-home elder care, and assisted living and nursing home facilities. The strains on social security and health care will need to be solved by the next generations. In addition, a study from the Federal Reserve Bank of San Francisco finds that as baby boomers retire, they are being replaced by younger and cheaper workers, which is holding down overall wage growth for the economy. Compared to previous generations, millennials tend to be more tech savvy and better educated. The latter comes with the curse of higher student loan debt, which has forced many millennials to move back in with their parents and delay the “adult” milestone of purchasing a home. According to the U.S. Census Bureau, the number of 18-to-34-year-olds living at home with their parents rose steadily between 2006 and 2012, right about the time that the youngest millennials were graduating from college. From 1983 (the beginning of the time series) to 2005, the percentage averaged 27.6%; over the last five years, it has stabilized at an average of 31.5%. The move back home was largely necessitated by adverse economic conditions. Millennials were witness to the Great Recession, which hit just as large numbers of them were graduating from college and looking for jobs. Older millennials also experienced the bursting of the tech bubble in 2001. As a result, millennials’ mindsets have been shaped by the fact that they have experienced recessions and tepid economic growth. This is in stark contrast to the baby boomers, who largely grew up during an extended period of American economic prosperity. Given their high debt levels and the dismal economic conditions they've been subject to, it makes sense that millennials are delaying major life events such as getting married, buying a home, and having kids. These influences are also key factors in how this generation sees work. Millennials saw first-hand that following the rules and doing things the way they had always been done worked out poorly during and after the recession. They want to do things their own way, placing job satisfaction above making more money. Millennials may be more inclined to start their own businesses in order to get the flexibility they crave. While baby boomers and millennials may be separated by decades in age, interceding recessions and changes in economic conditions have made them victims of similar circumstances. As such, they’re competing for jobs, homes, and other resources across the generational divide in unexpected ways. As discussed above, baby boomers are staying in the workforce longer and may find themselves looking to embark on a phase II career. This may be because they need to supplement their income due to losses suffered during the last recession or the impact of low interest rates on their fixed income stream or it may just be a desire to remain active and relevant. Regardless of the motivation, reentry into the workforce mean’s they are often willing to take lower pay in exchange for a steady income and a slower pace than their primary career. This puts them in direct competition with millennials looking for a first job that will give them experience. The result is that baby boomers and millennials more and more find themselves competing for the same jobs. Boomers and millennials also find themselves competing for the same homes. According to the 2016 Freddie Mac 55+ Survey, homeowners over the age of 55 cite cost and convenience as top priorities when choosing where to live. The survey also found that 71% of respondents plan to rent their next home. On top of that, anecdotal data suggests that retirees are moving to urban settings in order to be close to shopping and other amenities while millennials are moving to city settings in droves to be near jobs and social activities. Meanwhile, in the suburbs, baby boomers are looking to downsize while millennials are looking to buy their first homes. The combination of these factors puts baby boomers in direct competition with millennials for housing. In 2017, the NAR First-Time Housing Affordability Index fell below 100 for the first time since 2008. An index value of 100 means that a family with the median income has exactly enough income to qualify for a mortgage on a median-priced home. The combined impact of higher interest rates, lack of housing supply and increased competition for starter homes will continue to push house prices higher for both baby boomers and millennials. The aging baby boomer generation may no longer dominate in terms of size, but we will continue to see their impact on the labor market, the housing market, the health care industry, and the social security system for the next few decades. Meanwhile, millennials are shaping the world in their own unique way, and will probably be the ones to come up with the solutions to fix the structural problems that they inherit.